Hello all, I have been playing with my long arm god I love having it! So far I have done some outlining designs on a small piece (1/2yd) and mostly pantographs. 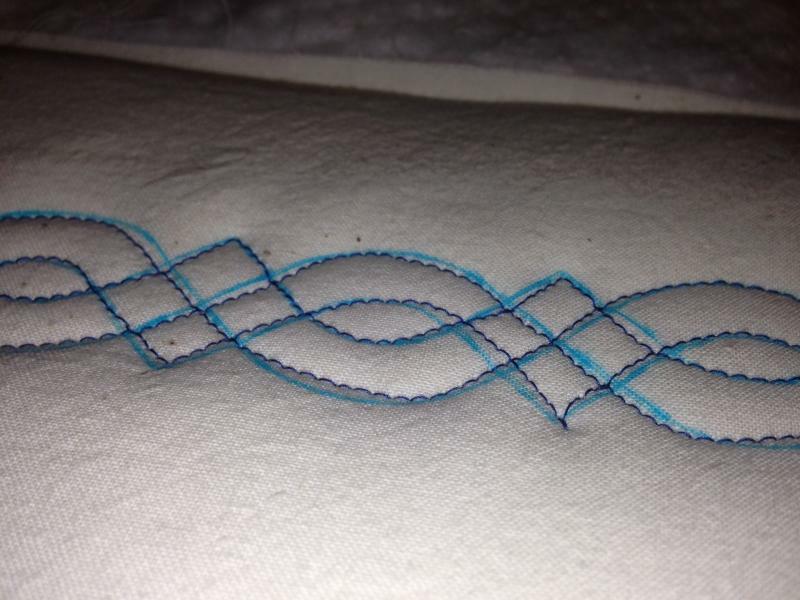 I finally took the plunge and marked a piece of natural muslin I had laying around with some of my celtic knots and braids. I loaded it today, used 2 layers of 80/20 cotton/poly batting. I have superiors So Fine in the top and some of connecting threads white poly in the bottom. The machine is running fine, my skills though need some building. I have some questions if some of you experienced long armers would help me out. I wanted to have a nice regular stitch, I set the machine to 12 stitches per inch. But have been having some issues. One of them, the superior thread keeps shredding and breaking. Not sure if it is a bad spool, bad tension or something else. Another issue is that the threads once stitched look very very thin. 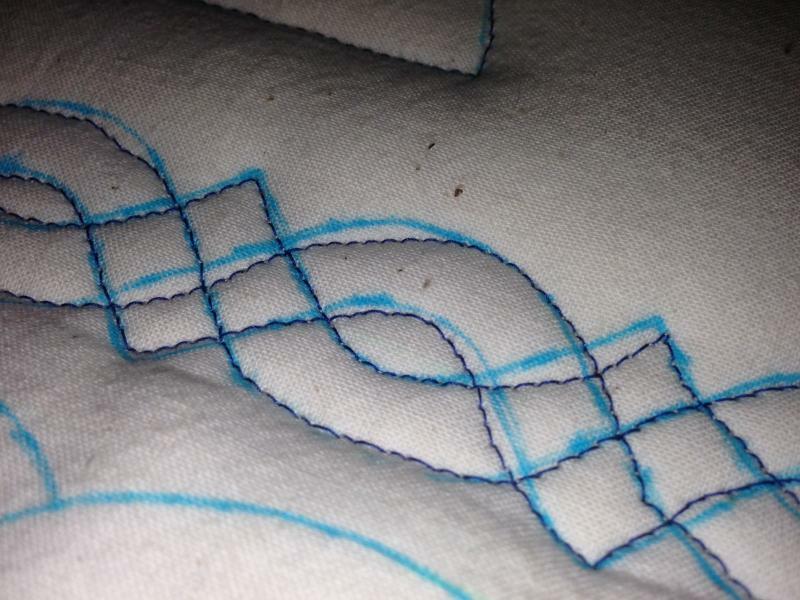 Not sure if it is the thread weight (am using a size 18 needle) here are a few very close up shots of the border area, I really could use some advice. Will say, my original LA teacher said that diagonals are harder than straight (L/R or U/D) to stitch...strangely I managed to stitch better on the diagonal than the straight...hmm. I think you are running your top tension a hair too tight as I see little dots of white (your bobbin thread) on top. Actually this is ideal to set your top tension. When you see those dots of bobbin thread give your tension 1/4 to 1/2 turn counter clockwise. Give a few stitches to ensure you don't see those little dots. It is not out of the realm of possibility you have a bad cone of thread or a burr on your needle. So if the problem persists after adjusting your top tension try switching needles, if it still persists try a different thread. I love, love, love Glide thread and Isacord threads. They are pretty strong and I rarely have issues with shredding or breaking with either of them. You can buy glide at http://www.bobbincentral.com/ and while you are there, spring for some magnaglide bobbins. You won't regret it! I am not a big fan of the Connecting threads stuff. Bought a cone, hated it, danced a jig when it was gone. LOL. But that is me. Others here love it. Their cotton is only slightly better but very linty and you will really notice with every bobbin change when you clean out the race area. Your bigger stitches surprise me, especially with lightening stitch, of which I lust after and don't have myself. I have Innova's plain vanilla SR and I have found if I increase my speed too quickly I will get longer stitches like that. Try to maintain an even speed and see if that doesn't help. Your larger stitches seem to be happening in areas that would be where you are starting to get speed up, but I can't be positive. Keep an eye on that and if it doesn't even out for you contact your dealer or call Innova. Someone will call you back within 15 to 20 minutes. And there is no reason you can't reset your SPI to 15, that may work better. Feel free to PM me any time to chat Innova and LAing. And congrats on your new machine! Oh one other thing you might try for your long stitches... Clean your SR encoders. Those are the wheels that run on the rail that have a cable attached to them. Not the wheels your carriage is running on but the ones that have a black rubber gasket around them. Take a q-tip dip it in rubbing alcohol and rub it on the black rubber gasket that is on the outside of the wheel. This may help. You can also clean your rails. I have done it with super fine steel wool, then afterwards a soft cloth also with a bit of rubbing alcohol on it. I was having an issue a while back like this only much worse then what you pictured and cleaning my encoder wheels worked miracles! 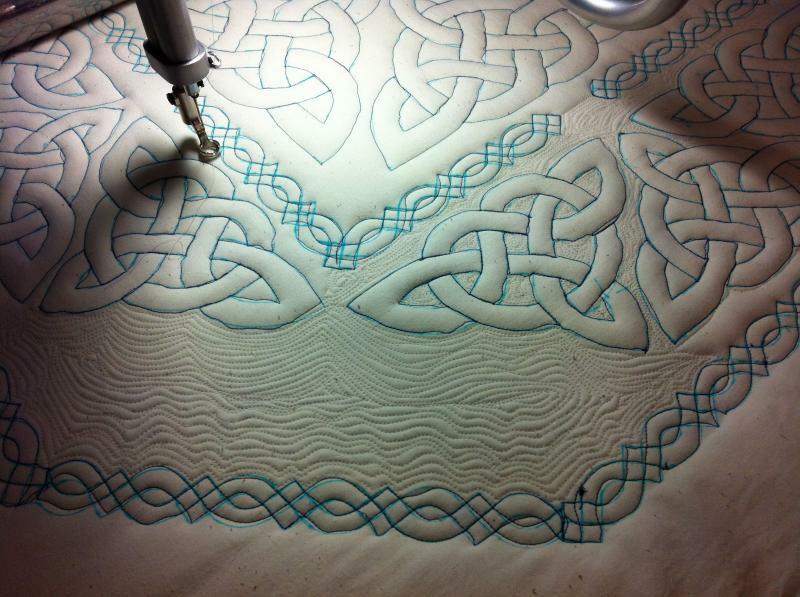 BTW, I love your celtic knot designs. Are they a stencil? Source please. Yeah been working tension quite a bit, tighten/loosen, etc trying to get the perfect one. This is just a practice piece. 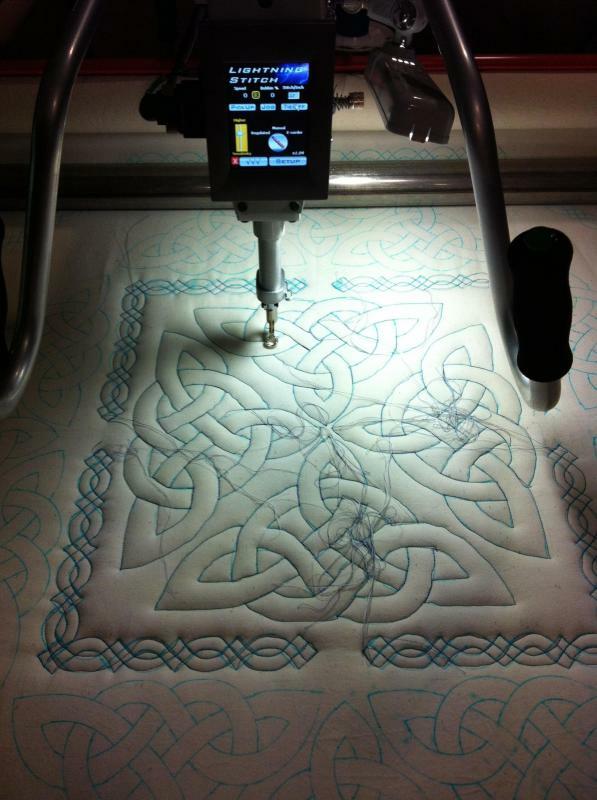 A lot of friends and family have been asking for the celtic knots on quilts and table covers etc. so figured I needed to practice doing them. The first couple I was really bad but by the time I got to the 15th one I was much better at staying on the lines. This is where I got my stencils, I have several of them and plan to buy a few more, they are very durable and easy to use. http://quiltingstencils.com/celtic-2.aspx Not to mention pretty inexpensive. I got the tension working just about the time I switched to the natural for the echo fills. Sigh, yes they are 50wt, was the free ones that showed up with the machine. Figured they were good for the practice piece. I went ahead and switched to a 16 needle. And then had a horrible time the bobbin thread wasnt picking up, I got so mad I just turned it all off and went to play computer games for the rest of the day. Slept on it, still mad....then it hit me..bet I put the needle in backwards, I took it out, made sure the scarf was in the back and viola it worked fine. Still getting a little shredding, checked bobbin tension to ensure it was ok. Then just tweaking top tension. Your doing great, just relax and have fun, I love this.